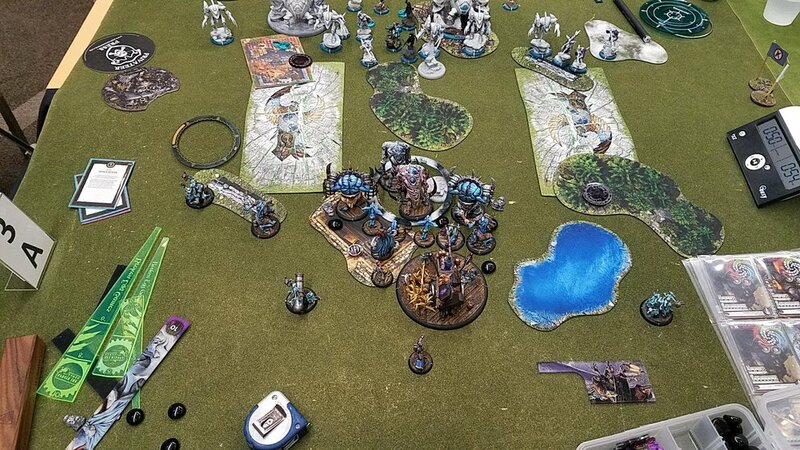 I know we've had ANOTHER big tournament since I started writing this battle report series, but I've gotta finish the reports from ATC before I can start writing the ones from the Las Vegas Open. 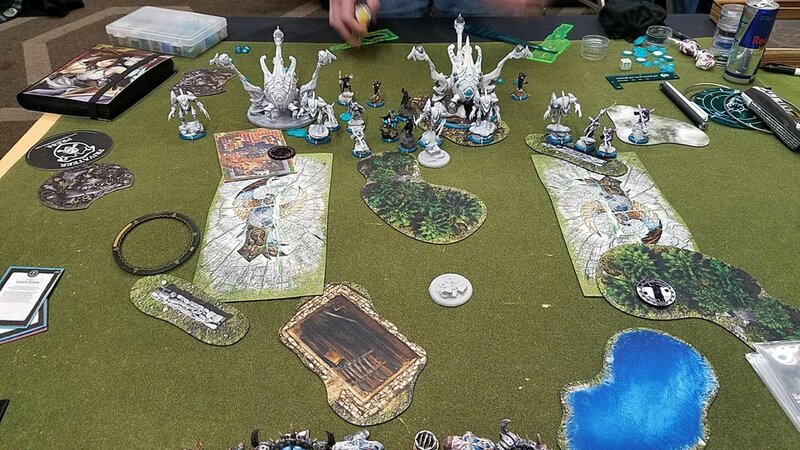 For the final round of this event, I found myself paired with another very nice gentleman named Nic who had both Issyria with a pile of Mage Hunters and Kaelyssa with no less than six Harpies. Either way, I figured Dreamer would be a better choice since we were playing Recon II, and I was surprised to see Kaelyssa across from me. I chose the Sacrifice and All Fall Down Arcana, as well as another one that was irrelevant to the game. I sadly lost the roll off, and my opponent opted to go first. I chose the side with the trench, since that plus Artifice of Deviation means that Kaelyssa needs to be throwing out a lot of Phantom Hunters in order to reliably hit things. Pretty simple here, everything runs forward. Flight on the Harpy is pretty sweet, as something Ret jacks traditionally struggle with is Pathfinder. Nic has spread out fairly wide, and I think I'm going to be able to capitalize on that with the forest in the middle and the Pathfinder objective (Nic took the repair objective). The plan is simple. Stick a Miraged Skin and Moans up in front of the objective inside an Artifice of Deviation and threaten a lot of the table. Also, don't let the Dreamer die. Very important that. Everything runs up in the typical Death Knell clump and things are all in the trench or in the Artifice that can be. He is in range of my army with basically everything he has, but Shield Guards, the forest, and the relatively low POW of Harpy shooting keeps my models in good condition, only losing a Crabbit. 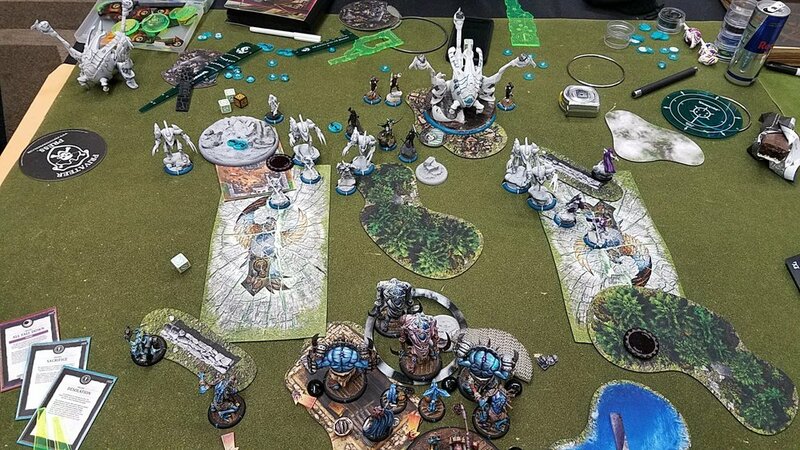 Kaelyssa moves up at the end of the turn and shoots Dispel shots at the Miraged Skin and Moans until I run out of Shield Guards and Mirage drops. She pops her feat. Interestingly, her shooting the Skin and Moans means that she's within 12 inches of it. I've got a couple of choices here, but after debating, I decide to just throw my army at Nic and see if he can survive being engaged by multiple heavies. I'm actually pretty proud of this line of play. Without being able to charge anything, most of the time the Kaelyssa army gets another turn of shooting, and that might have been enough to really mess up some of my heavies. Since Kaelyssa is within 12 inches of the Skin and Moans she shot at, he gets Pathfinder from the objective and runs to engage her and a couple of models. When all is said and done, the Death Knell is base to base with my objective and a Rattler and the Cage Rager is completing a Line of Sight blocking barricade from the right half of the table. Dreamer has only cast Artifice of Deviation this turn, so she's camping five with a Crabbit and in a trench while Incorporeal to avoid Electro Leap death. Kaelyssa is engaged by a Skin and Moans that's in an Artifice, and both of my Skin and Moans are engaged and in Death Knell Aura for a pretty okay statline of 17/19 against shooting. I score a point on the right hand flag, and I have another Gremlin Swarm run base to base with both a Harpy and the AFG on the left. Nic is in trouble here, and he knows it. He spends multiple activations trying to kill the Gremlin Swarm next to his AFG and fails, so the AFG has to kill it and can't shoot at the Dreamer well thanks to the -2 to hit from Mischief. Nic blocks Line of Sight to Kaelyssa with Sylyss and the Lyss Healer, but they can't block the line he needs to get around my Skin and Moans to try and assassinate my caster. The free strike would have killed her if not for focus reduction, and I've got way too many transfers on the Dreamer plus a Crabbit for his assassination to have any chance. His right hand models all take shots into the Skin and Moans but DEF 21 against shooting is a thing and only one lucky box cars hits. I score another point at the end of Nic's turn, and he's down to about 5 minutes on his clock. I could try and kill Kaelyssa, or I could win on Scenario without having to try killing a caster. Either way, the KDed Skin and Moans pays to stand, and things start off with the Dreamer casting Manifest Destiny. 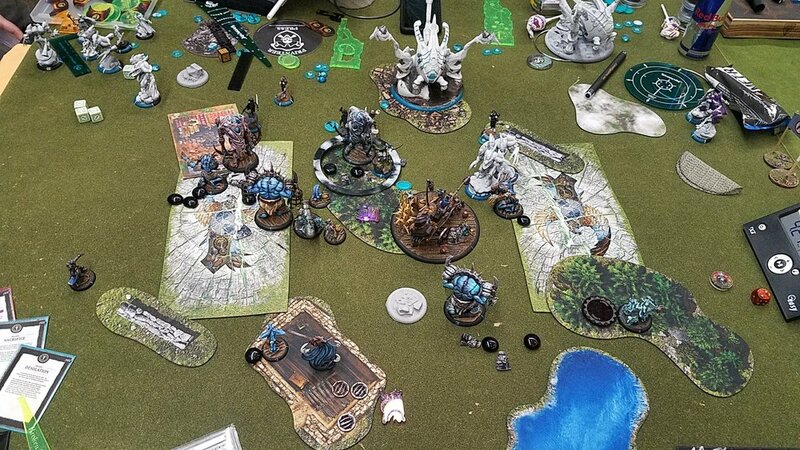 The Rattler clears out the left Electromancers and actually kills a Harpy. An Enraged Skin and Moans makes short work of the AFG and other Harpy, and that zone is mine now. The other Skin and Moans turns, kills the objective, and then one shots Kaelyssa for spite, and I end the game at 5 - 0. I really liked this Ret list, but I don't think my opponent was prepared for my turn 2 play at all. Normally, Kaelyssa lists I've seen run double Halbs to force the Scenario game way onto the other persons side of the table. This trades that out for a lot of boostable POW 13 thunderbolt shots. Into this specific matchup though, the Halbs are way better since I have multiple Shield Guards and mobile cover, while Kaelyssa can only chuck out Phantom Hunter 3 times which tends to not be enough. This was a fantastic game, Nic was a tremendous opponent, and I'm sorry it took me so long to get it posted! Real life has been a bear, but hopefully I can get some LVO battle reports up soon!